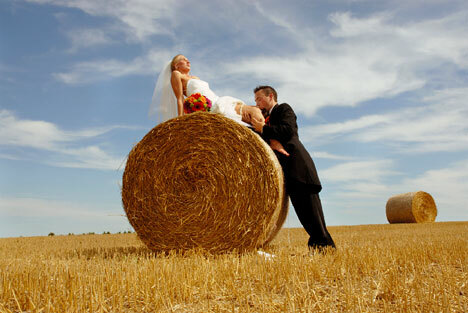 Thinking outside the (wedding photography) box? Kitchener wedding photographer Tony Ward, from Accent Studios Photography (website: eyetothesoul.com), prides himself on finding and utilising obscure and different locations... The way he tells it, .. everyone else is lining up for the same old perfect spot in the flower garden.....while I'm shooting works of art in a gravel pit...lol. Accent's motto: Boundaries expanded to limits unspoken and their tagline: A Definite Edge. Edge indeed! But also making the most of what the area has to offer, as in the following photograph, for example.